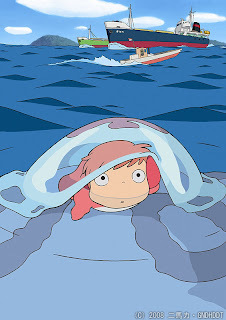 Ponyo is a retelling of Hans Christian Anderson's classic fairytale The Little Mermaid. The plot centers on a goldfish princess named Ponyo who dreams of becoming a human, and her friendship with a five-year-old human boy. I've always found The Little Mermaid to be brutally depressing (actually, I find most of HCA's stories to be brutally depressing), but Miyazaki hasn't failed me yet. I don't know when this movie will be released in the States, but I'll be there with bells on.